Имате въпрос към Avana Laemchabang Boutique Hotel? Сгушен в сърцето на Лаем Чабанг, Avana Laemchabang Boutique Hotel е идеалното място, от което можете да започнете Вашето приключение в Чонбури. Хотелът не е далеч от центъра на града - намира се само на 15 km от него, а до летището се стига за около 45 минути. С удобното си местоположение хотелът предлага лесен достъп до всички градски забележителности, които задължително трябва да се видят. Съоръженията и услугите предлагани в Avana Laemchabang Boutique Hotel гарантират Вашия приятен престой. Хотелът осигурява безплатен WiFi достъп във всички стаи, 24-часова рецепция, Wi-Fi връзка в общите части, паркинг, рум-сървиз, за да гарантира комфорта на своите гости. Хотелът се характеризира с 181 стилно обзаведени стаи за гости, в някои от които ще намерите хавлии, пантофи, допълнителна тоалетна, телевизор с плосък екран, огледало. Хотелските съоръжения като спа, масаж са идеално място за почивка след тежък и уморителен ден. Avana Laemchabang Boutique Hotel е добър избор за всички посетители на Чонбури, защото предлага спокойствие и безпроблемен престой. Damaged stuffs e.g. steel rod in the bathroom and wooden part in the wardrobe found in room with no action taken even if reported. Walk-in promotion is better than ones from Agoda. Next time, just check with the hotel directly to get cheaper price. Cockroach seen in the dining room. Food was so so and low of variety. You could clearly see that the isn’t maintained like it should be. No ligt in the elevator ( they repaired because I asked it), bad internet and Tv ( they repaired signal TV after the third night that we stayed). Worst of all was the breakfast really below any standard!!! We eat elsewhere. The staff did what they could but in my opinion you have to take this hotel of the list. Some rooms are not ready for guests. I have to change my rooms for 2 times because the first room was not ready to use, something was broken. The second room has a problem with the light. The the third room was ok. Staff is helpful. Good breakfast! One thing I don't like is location. It's far from the beach. 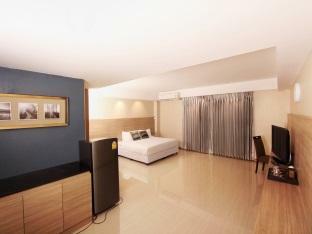 Friendly and helpful hotel staff, very clean and comfy room and hotel area, free usage of fitness gym and pool. We are very thankful that we choose to stay in this hotel during our vacation in thailand. Very quite or peaceful. All staff were very friendly and they will really attend to your needs. Nice pool to swim intm the morning and fitness gym to use in the evening. Although the location is not that very close to the shopping mall or nice restaurant but the hotel will book you a taxi going out to the area for 300 baht the cheapest fare going to harbor mall the nearest shopping area in the hotel common to locals of Laem Chabang 10 mins. away, where very good local restaurant located that served authentic classic thai and japanese cuisine with very affordable prices. If you want to go to shopping in bigger malls like center mall in Pattaya City where foriegners are very common but you will ask to pay more expensive foods and all for tourists price. For taxi you will pay 1000 baht when you heed to Pattaya City 20 mins away from the hotel. There is a motorcycle that serves locals it will just cost 20 baht cheapest. It it only 10 minutes driving from the hotel to the institute that I have the business with and less than 10 minute driving to the department store. The hotel staffs can speak English quite well and have serviced minds. However, the hotel is not fully finished. Some parts are still under the decoration such as the swimming pool. Anyway, I am happy with this hotel. We were advised to stay here because the one we would like to stay was cancelled through AGODA. 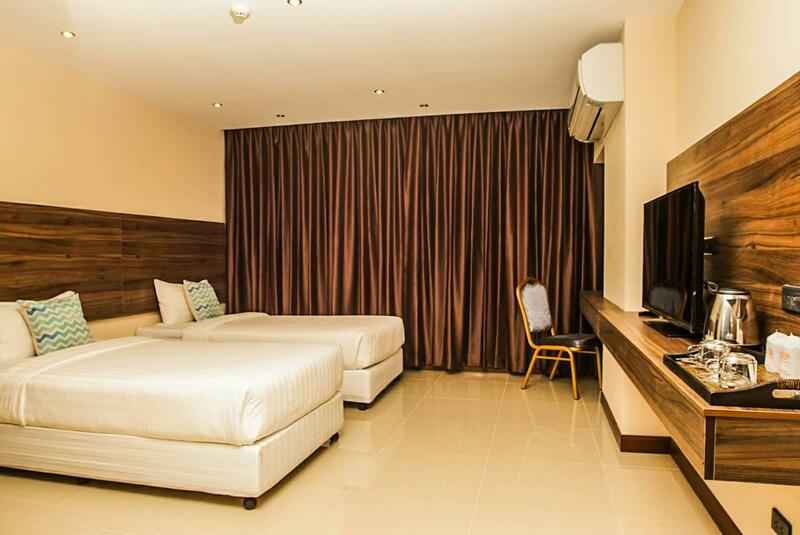 + The room has plenty space for family including the restroom and they offer breakfast 6.00-10.00 with reasonable price - I think this building is modified from old hotel. There is a small step to enter the room or get in to the bathtub. This is not suitable to old people. The location of the hotel is in small "soi" or street and quite hard to look for the hotel if you're not local here. Room type in Agoda website does not matched with actual. I booked Premium 1 Kingside and 1 bed for family but I got only 1 Kingbed. However, it is valued for money. Food is basic and salty. Nevertheless, food variety is better if compared with competitor. If you do not have a car, location is far. It is difficult to find food nearby. Good hotel for who love swim and fitness exercise on long weekend. Sometime a lot of Chinese quests, normal breakfast but good test, not far from a department store, market and local restaurants but they are so far to walk, you should have a car. I love to take a vocation there. This hotel is catering for the local Thai as most staffs do not speak English. The room is clean but the door does not view holes and also, it is too thin. Surprising is that the hotel got a nice swimming pool. The room doors are not properly sealed and there is no pinhole to view outside before opening door. Overall, the room and toilet are clean. TV only have two channels in English. Hotel is mainly catering the local Thai. Nearby got many eatries so at night is not an issue. I stayed here for 2 nights recently. The hotel is beyond my expectations.The room is spacious and clean.Air con worked well.It seems the management takes good care of the customers.Staff is polite and attentive to guests' request. Breakfastbuffet is decent.Variety of choices.The buffet seems catering for Asian. Parking is ample. There is a swimming pool and gym! 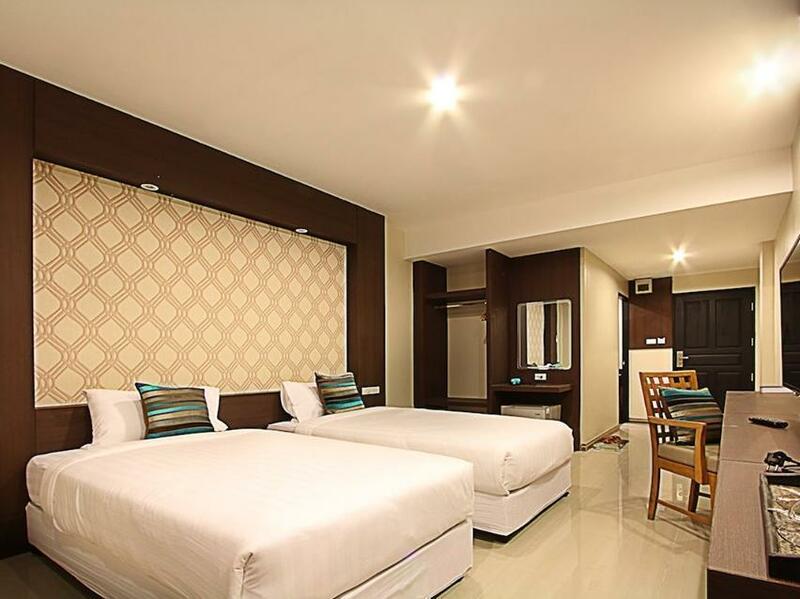 It can compare to a 4 star resort on tourist places like Phuket Samui in aspect of facility and service minded. But the price here is ten times cheaper! Just one thing I don't rate it as a 5 star is that the entrance to the hotel is a narrow arrey which is hard to notice. In summary,I like here and definately will be back. Hotel is in a hidden location, and google maps got confused many times before we could find this place at night. We arrived late but unfortunately right behind an obnoxious Chinese group tour. The guide proceeded to bully other guests (me), the staff while the tourists swarmed the poor lone receptionist. Took over 45 minutes to get a room key. The larger room we booked was sparsely appointed with minimal furniture. The single lift was small and slow and insufficient to handle a hotel of this size. Breakfast was forgettable standard fare. Nevertheless, this hotel was cheap and new'ish, and plenty of parking space. I would not return though. We have a late check-in and there's a problem with the door knob which we can not enter the room. The staff come for help and still doesn't work. So we asked to change the room and lucky it's available. The Avana Laemchabang Hotel has genuine potential and this is the third time I have stayed there. However, the hotel has been in constant construction since my first trip and the quality of workmanship, especially in bathrooms is terrible. In the bathrooms, paint and cement cover tiles, grout falling out and drains have bad smell. It won't take long for the bathrooms to require complete renovation! This last trip there was no shower curtain, no hook for the toilet paper roll, no hot water for shower in the morning. The hotel clearly needs a professional manager and intensive traing for the staff who are friendly, but don't know how to run a hotel. Breakfast mediocre at best and WiFi inconsistent. The Hotel clearly has great potential but the owner needs shaking up from his slumber and lack of hotel management skills. Very difficult to find the hotel. Even GPS unable to locate the place. 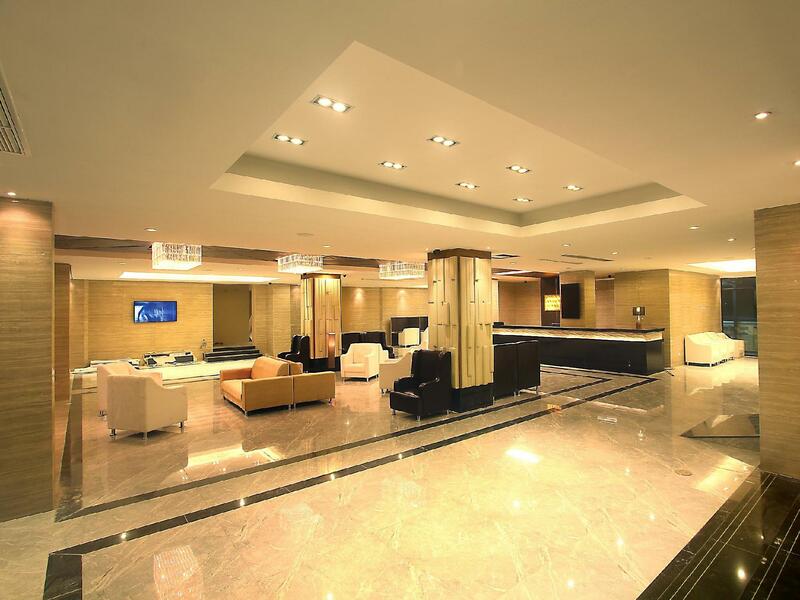 Suggested to the traveller set the location to LaemChabang International Hostipal. Just before the hospital (less than 50m), turn in the junction on your left. You will enter to the road heading to the hotel. There is a big sign of the Hotel while you at the junction. If you do not have car, it is very inconvenience. 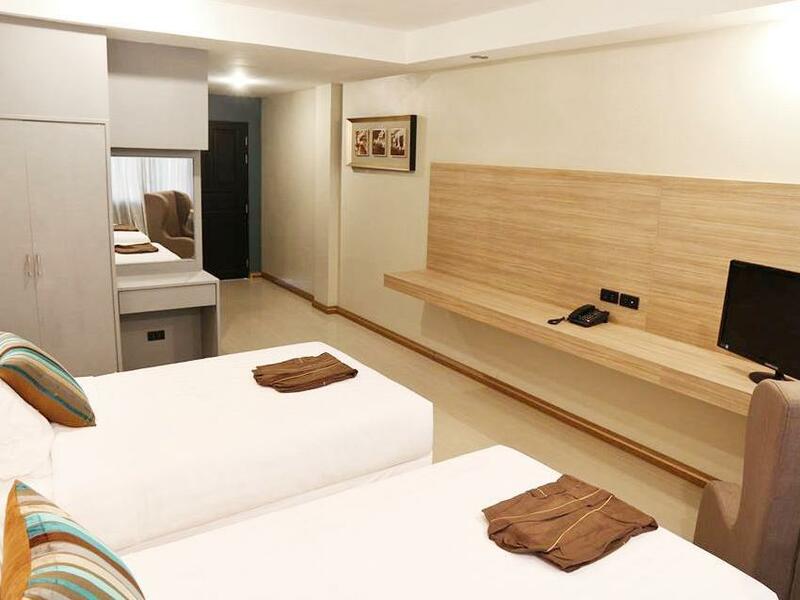 Good stay but just a short night after checked-in very late night and get up early morning to get to work, room is new &outstanding modern at this price. It is a good business hotel but you must have a car because it was hiding in isolated area and not easily find(Bad directional signage).